Today is your big day; you are all set, dressed in your best clothes and looking your absolute best. Your mind is time travelling, thinking about your bright future. You are starting a new venture, a new business. All your life’s wealth is at stake. A good beginning, makes a good end, hence, you choose the day of Akshaya Tritiya for starting your business. Like all Indians, you too believe in the auspiciousness of this day. Akshaya in Sanskrit means, the imperishable or the eternal. It falls on the third tithi (date) of Shukla Paksha of Vaishakha (Lunar Month). This is one of the most auspicious occasions (Shubh Muhurat) of the year. Oh! Yes, Shubh for starting a business, getting married, purchasing new stuff, buying jewellery or even having a baby. All the retail stores propose big bumper sales on this auspicious occasion. So, all the shopaholics out there, it’s your day. This day is perfect in a lot more ways; both the sun and the moon are most radiant and best placed on this day. Isn’t it an astronomical miracle? Akshaya Tritiya holds enormous significance for The Hindu’s as well as The Jains. One hand, for The Hindu’s it’s the incarnation day of Lord Parshurama, the 6th avatar of Vishnu. In addition to this, it is also a day when Ved Vyas and Lord Ganesha started writing the great Indian epic ‘The Mahabharata’. On the other hand, The Jains regard this as the day when Tirthankara Rishabha ended his yearlong fast. Furthermore, it’s also the Golden Festival of India, quite literally. People purchase gold, as it is the ultimate symbol of wealth and prosperity. Any venture initiated or asset purchased on this day, as the popular belief goes is destined to reach great heights. Auspicious Tip: This year Akshaya Tritiya falls on May 9. It is said that all investments made on this day will have unlimited increasing in value. And gold jewellery is the most popular choice as a gift for Akshaya Tritiya. We, at AuGrav, have listed below 9 unique gold jewellery items that can serve as the perfect gift for Akshaya Tritiya. Hurry, go through the list and pick your favourite gold jewellery for Akshaya Tritiya! This religious Lord Ganesha pendant can be the ideal gift for Akshaya Tritiya. Lord Ganesha is a symbol of knowledge, wisdom and happiness and what better way to celebrate this auspicious occasion than with a Lord Vinayaka Pendant! Sporting a beautiful Lord Ganesha design and adorned with shimmering diamonds, this diamond Ganesha pendant will be the perfect pick to grace any special occasion. 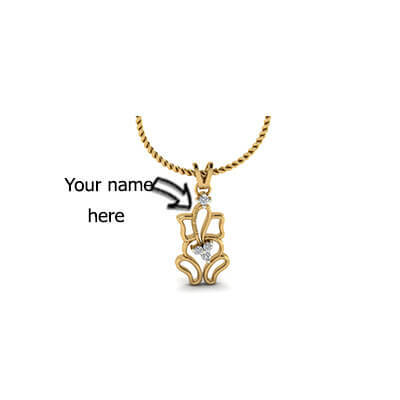 You can even personalize this pendant by engraving your partners name on it. We say this religious Ganesha pendant is one of the most unique gifts that you can present to your loved one on this special day. An auspicious occasion like Akshaya Tritiya needs a special piece of jewellery and our name engraved gold coin is one such ornament that will be cherished for years to come by your near and dear ones. Beautiful and elegant, this gold coin can be personalized according to your style and requirements. Whether you engrave your parent’s name or your partners initial, this customized gold coin will be the perfect Akshaya Tritiya gift. A new take on the classic gold coin, this name engraved coin will be unlike any other piece of precious metal you own. Can it get any better than this? 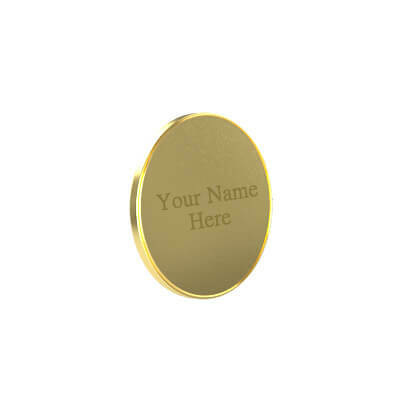 Along with your name, you can even add your loved ones photo on the other side of the coin. Gift this photo engraved coin to your loved ones and let them know how much they mean to you. Gold coins and Akshaya Tritiya are synonymous with each other. Unique and beautiful, this personalized gold coin will definitely prove to be a lifetime investment! An initial pendant can serve as an excellent gift to mark a special occasion like Akshaya Tritiya. Just like the day of Akshaya Tritiya makes itself known in the Hindu/Jain calendars, this diamond and gold pendant is guaranteed to make your presence known on this auspicious occasion. Adorned with two sparkling diamonds, this elegantly designed ‘R’ pendant is made especially for those who love unique and bold jewellery. A royal gift to present on a royal day! On this holy day when “Mahabharata’ was written, make a lovely gesture of gifting a royal gift to your loved ones. 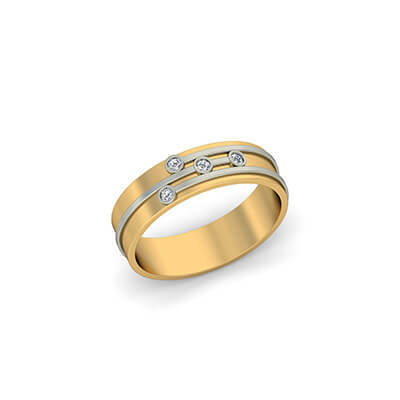 The versatile design of the ring is matched only by the luster and shine of the gold. Featuring a mesmerizing design, you can also personalize this ring by engraving your sweetheart’s name on it. 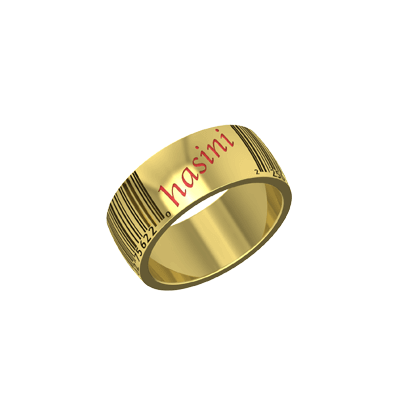 There can’t be a better gift than a personalised name ring on this auspicious day! It is said that Akshaya Tritiya is an auspicious day to carry out any venture. Spread your success and fortune with your beloved by gifting him/her the lovely ‘Husband and Wife Fingerprint Ring’. Every fingerprint is unique. No two individuals have the same fingerprint patterns. 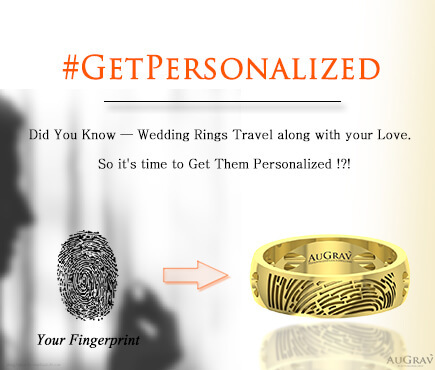 Renew your bond with your spouse by presenting this ring engraved with your fingerprint on it. Its unique design coupled with the auspicious occasion of Akshaya Tritiya will ensure that this customized fingerprint ring will be treasured by your spouse for eternity. 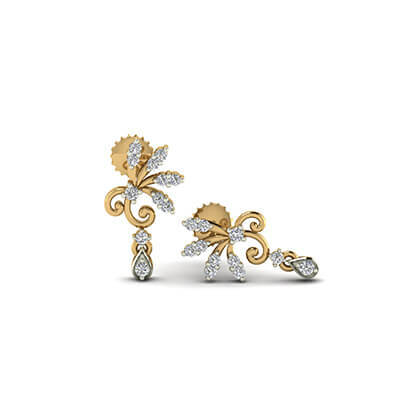 This pair of elegant golden drop earrings aptly portray the serenity of the day, Akshaya Tritiya. 22 sparkling diamonds placed artistically on a rich gold base further adds to the allure of these stunning golden drop earrings. These dazzling earrings will reflect your happiness and goodwill, thus making it a lovely gift for this holy occasion. Bored of giving the same old gift for Akshaya Tritiya? Add a twist to your Akshaya Tritiya celebrations with this etched barcode ring. 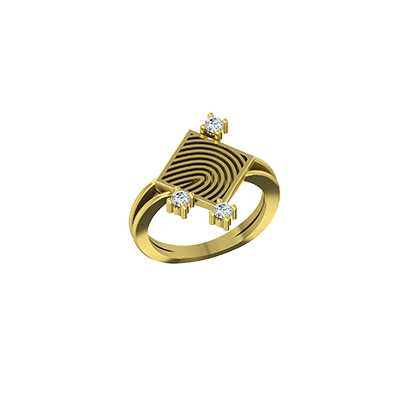 This gold ring with a quirky barcode pattern will add just the right amount of bling to your outfit. Want to know the best part about this personalized barcode ring? You have the option to customize it according to your liking by adding the name of your choice on the inside of the ring! They say bracelets are the perfect gift for Akshaya Tritiya. The reason is plain and simple. 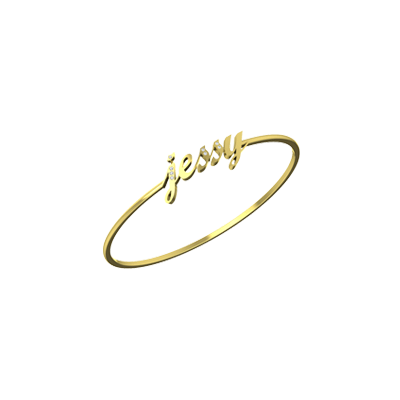 There is something mystical about personalized bracelets that instantly add glamour to any outfit and elevate your look to the next level. Studded with 8 dazzling diamonds, this personalized name bracelet will be the perfect jewellery accessory for Akshaya Tritiya. Top 9 Gift Ideas for Akshaya Tritiya Overall rating: 4.7 out of 5 based on 235 reviews.